A posh, 4-star Beverly Hills hotel within walking distance of the Century City Shopping Center. As you might imagine, we don't make a habit of staying in four-star hotels. 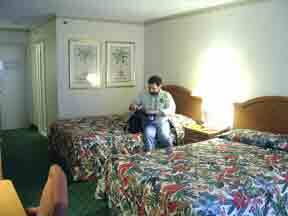 But on our recent visit to Los Angeles, we needed a quality hotel at an affordable price. How much does the Orlando Airport Marriott cost? As of May 2003, rack rates are in line with other business hotels -- about $175-200/night. And a sign on the back of the hotel room door listed the maximum room rate at $225/night. But before you get discouraged, much lower rates are available online for this hotel. For example, Expedia.com was listing this hotel at $66/night at the time of writing. What did we pay? Just $37.00. We used Priceline.com, which is a bidding site (see our article on Priceline at http://www.passporter.com/articles/priceline.htm ). While there's no guarantee whatsoever you'll get the same hotel or rate if you bid on Priceline, it may be worth a try if you're on a budget. Upon your approach to the hotel, you'll observe that it overlooks a pleasant pond and some expansive grassy areas. This is remarkable when you consider its proximity to the aiport. Inside the hotel a bright, airy lobby greets you. 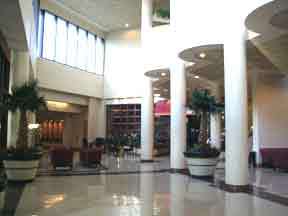 The check-in counter and elevators are to your right, the restaurant is straight ahead, and the shops are on the left. The two-story lobby is elegant but simple. It is reminscent of many other business-class hotels we've visited in the Orlando area, including the Hilton in the Walt Disney World Resort. The hotel was built in 1983 and renovated in 1998. Check-in went very smoothly and quickly. 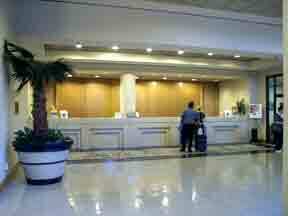 In fact, we were very impressed by the friendliness and efficiency of the check-in desk staff. They made us feel very welcome! There were no hidden costs (at least that we could tell) or extra fees. Check-in took less than a few minutes. Despite our 6:00 pm arrival, there was no line and very few people around. When we were finished, we took our luggage up to our sixth floor room. We could have requested assistance with our luggage, but we felt it was faster to wheel it ourselves. There are 484 guest rooms spread over the 10-story hotel. We had room 636, which had two double beds. Rooms with one king-size bed are also available, and all rooms accommodate up to 5 guests. Room 636 was a standard, non-smoking room with a work desk, two-line phone, a comfy chair, an armoire with TV (no mini bar), clock radio, coffeemaker with complimentary coffee and tea, a closet with a hanging rod, an iron and ironing board, and a free newspaper on weekdays. A large picture window overlooked a roof below -- there are no balconies at this hotel. The small, boring bathroom had a hair dryer and basic toiletries (shampoo/conditioner, lotion, and a bar of soap). The entire room was clean and pleasant. Of note, there did not appear to be an in-room safe -- if you needed to store valuables, you'd need to take them to the safe desposit box at the check-in desk. 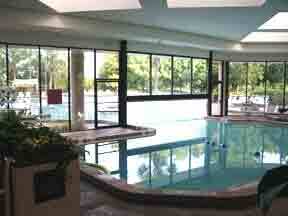 The indoor portion of the pool. While this isn't a resort hotel, it doesn't skimp on amenities either. There's an indoor/outdoor heated pool (indoor pools are rare in Orlando), a hot tub, health center, sauna/steam rooms, tennis courts, and basketball courts. While the kids may enjoy the pool, it should be noted that there is no wading pool for young ones nor is there a game arcade. As this is a business hotel, a full-service business center is available along with meeting rooms and secretarial services. A basic but large gift shop is near the lobby. It should also be noted that parking is complimentary. A full-service restaurant, Murphy's Chop House, is open daily for dinner. For more casual meals, Paradise Cafe has American foods for breakfast, lunch, and dinner. A pool bar, The Landing, serves drinks and sandwiches seasonally. Kick's Lounge offer appetizers and drinks in the evening. And room service is available as well. The Orlando Airport Marriott worked like a charm for us. Easy-in upon our arrival, easy-out in the next morning. We highly recommend this hotel to anyone needing a room in the Orlando Airport area for a night or two. Please note, however, that we would not recommed this hotel as your "base of operations" if you intend to visit Walt Disney World often during your trip -- it's a half an hour away and there are plenty of closer hotels that offer good rates. 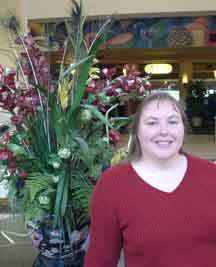 Co-author Jennifer smiles for the camera in the lobby.